Remote Desktop sharing has become a popular activity in the days of the Internet and TeamViewer is a new and popular product which allows you to request or provide help to other people with this software installed. In effect, it serves as both a server and a client. This means that users have the ability to connect to you when you allow it and vice-versa. Each time you run TeamViewer, you get a unique session ID. Version 13.2.14327 is a freeware program which does not have restrictions and it's free so it doesn't cost anything. 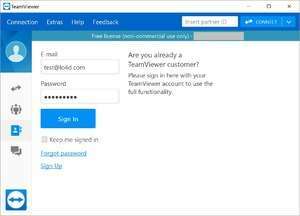 For security reasons, you should also check out the TeamViewer download at LO4D.com which includes virus and malware tests. Additional screenshots of this application download may be available, too. TeamViewer has a presence on social networks.